San Jose has the lowest unemployment rate and the most jobs per person among the 50 largest U.S. metros, along with the highest home values and forecasted home-value appreciation. While other West Coast markets – most notably Seattle – have slowed down, San Jose continues to see double-digit home value growth. It has led the country for home value appreciation, which it should do again during the early months of 2019, though the market is doubtlessly facing headwinds. For-sale inventory in San Jose has doubled in recent months but remains tight. It also ranked highly for income growth, with the typical household income growing by 6.8 percent. The impact of the tech industry on housing is also apparent on Zillow’s list. Along with the San Francisco Bay Area markets of San Jose and San Francisco, four metros (Atlanta, Dallas, Denver and Nashville) in the top 10 were finalist markets for Amazon’s HQ2 and have growing tech industries. 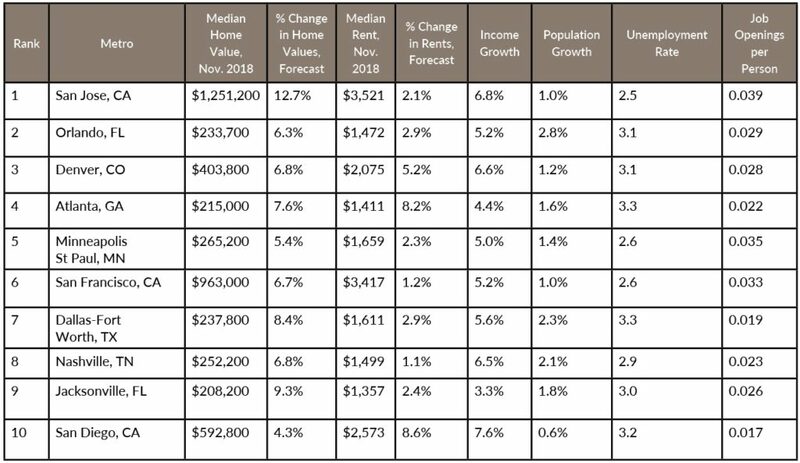 Zillow used six variables to determine the hot market rankings: Zillow’s forecast for the change in the Zillow Home Value Indexi and Zillow Rent Indexii over the next 12 months, recent income and population growthiii, current unemployment ratesiv, and the number of job openings per person using data from Glassdoorv. Those six variables were then scaled for the 50 largest U.S. metros and combined to produce the top 10 list.